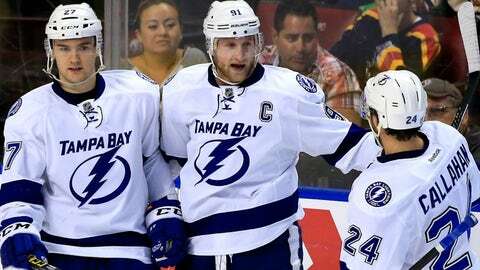 Steven Stamkos (center) and the Lightning are looking to stay healthy heading into the playoffs. SUNRISE, Fla. — The Tampa Bay Lightning are limping home with smiles on their faces. Wrapping up a five-game road trip in which its offense dried up and its defense became banged up, Tampa Bay found both again here in a 4-0 win over the Florida Panthers Saturday night. The victory clinched home ice in the first round for Tampa Bay, and moved it into a tie with the Montreal Canadiens for the Atlantic Division lead at 104 points. "We knew we were playing for something," Lightning captain Steven Stamkos said. Even with a division title in reach, the Bolts are more concerned about getting healthy. Sure, something to celebrate would be nice, but not at the expense of an early exit in the Stanley Cup playoffs. "I’m not even worried about who we’re going to play now," Lightning coach Jon Cooper said. "When it’s all over after 82 games and you’re on top, would it be really cool to have a banner you can hang? I think that’d be awesome. But getting home ice for some portion of the playoffs is more important." As Tampa Bay’s trip progressed, the idea of clinching home ice might have seemed a reach as its situation started to spiral. Outside of a 5-3 win over Montreal on Monday, Tampa Bay’s offense was held to a goal or less in three of its last four games. The Lightning also lost three of its top defenseman — Victor Hedman, Jason Garrison and Andrej Sustr — to injury. "I know we don’t want to talk about the injuries," Stamkos said. "Those guys are pretty key guys in our lineup." Thrust into the mix were rookies Luke Witkowski and Slater Koekkoek. "For those [young] guys to come in, step up in our lineup and in some not-so-easy buildings on the road, too, give credit to the guys who have stepped up, especially on the back end," Stamkos added. But here in South Florida, Tampa Bay found a way to keep its situation from getting worse. The Bolts won for the first time all season when concluding a five-game road trip. The victory also assured Tampa Bay it would not finish the campaign with a three-game losing streak. "It goes to show when things do go the wrong way, we have the character to stop it and realize it," Stamkos said. "That’s kind of the first thing — realizing when things aren’t going the right way and correcting them. We’ve done a great job of that." The turnaround might be credited to the captain himself, who ended a season-long, seven-game goal drought. Stamkos put Tampa Bay on the board 6:10 into the second period with a power-play tally from the left circle, then padded the lead just over five minutes later. He picked up his third point of the night 53 seconds into the third, assisting on Ryan Callahan’s goal from the low slot. "I knew if I kept working hard, which I had been the last couple games, I knew I was going to get rewarded," Stamkos said. "I got some nice passes from the guys tonight and was able to score. It’s a confidence builder." Tyler Johnson, sidelined with an upper-body injury for three games, returned to the lineup and also picked up a goal in the win. 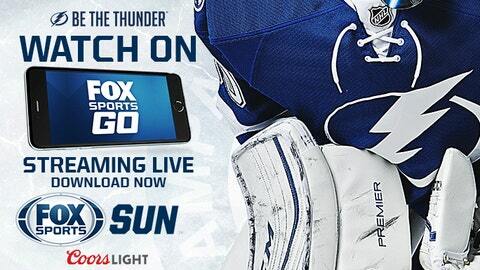 Print out the Tampa Bay Lightning 2016-17 FOX Sports Sun broadcast schedule. Ben Bishop, held up his team behind the blueline with a 34-save shutout, his fourth of the season. "I thought it was a good road trip for the situation we were in and teams we were playing," Bishop said. "It’s going to be nice to get home, get some rest here — well-deserved — and kind of relax and get ready for these last two games." Tampa Bay has a four-day break before hosting the New Jersey Devils on April 9 and the Boston Bruins on April 11. They’ll get at least another three-day break before the postseason officially begins April 15. "Staying healthy means a lot going into the playoffs," Bishop said. "It doesn’t matter if you’re the best team in the league but missing a lot of guys. It’s going to make it hard to win in the playoffs [without them]. Hopefully, we get them back right before that and move from there." "It’s definitely going to be welcomed," Stamkos said of the extended rest. "It’s been a long trip. We’ve got to get some guys healthy, get back into the last two games, get the timing back and wait and see what happens in the playoffs." There’s still a little scoreboard watching to be done in Tampa Bay, too. The Panthers, whose playoff hopes were dashed in the loss, face the Canadiens Sunday. "It’s funny how that works," Cooper said. "You’re rooting against one team one night, then cheering for them the next." At least they’ll be watching from the comfort of home.